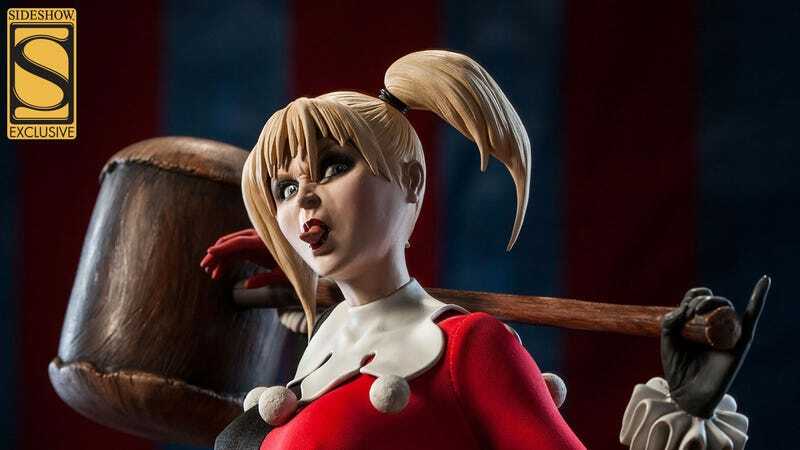 I'd say the exclusive head on Sideshow Collectibles' new Harley Quinn figure has a face only a deranged lunatic could love, but I'm worried about what that says about me. Sporting a full cloth costume, a giant wooden mallet and her trademark jester headgear, the standard version of Sideshow's premium format rendition of Harleen Quinzel is a fair representation of what the character looks like in the cartoon and comics. She's the Harley Quinn we see wandering the halls of comic book conventions in large numbers — easy mode Harley. Anyone can put on a mask and be recognized as the Joker's girl Friday. But there's much more to Harley than a mask and a mallet. There's the sass — the most deadly sass you ever did see. I'd say attitude, but that brings to mind early 90s video game mascot characters wearing sunglasses and surfing on sharks. She doesn't have an attitude — she is an attitude. She's this attitude, right here. Such a brat. She's perfect. Standing 21 inches tall and weighing 9 pounds, the premium format Harley Quinn is now available for preorder at Sideshow Collectibles. You've got to have mad love for the character to shell out $359.99, but that face is enough to make anyone go a little crazy.